We hope this biker chick has some fond memories? 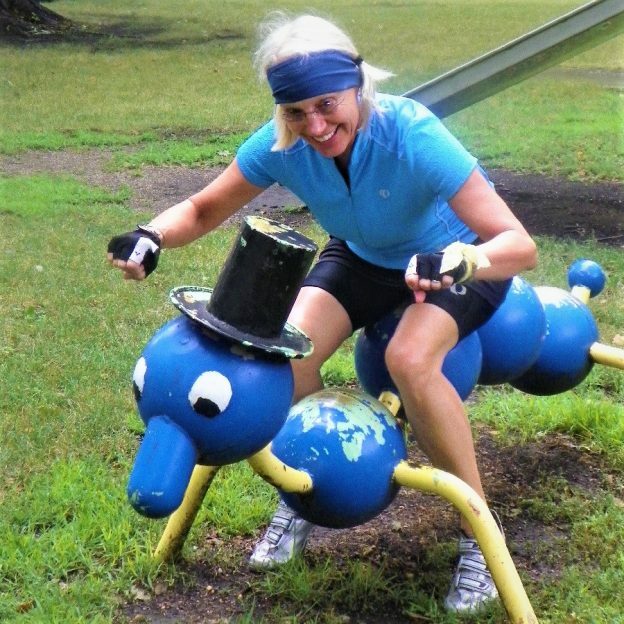 We caught her stopping in a park along the Minnesota River Trail having some fun, reliving part of her childhood. 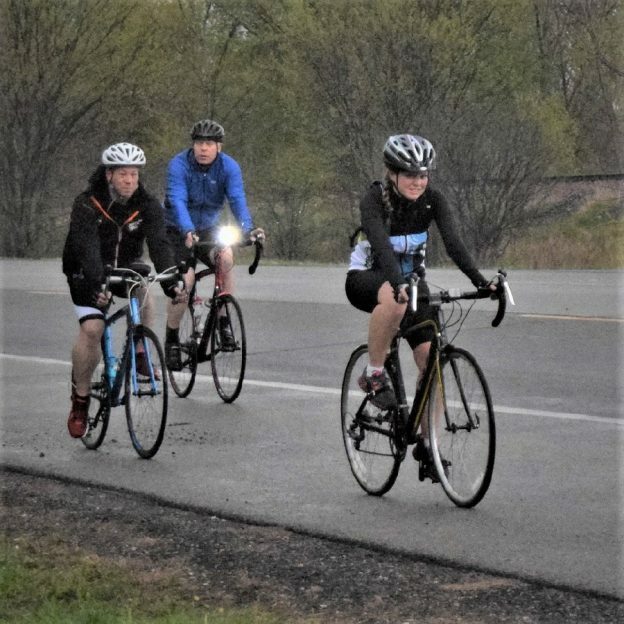 This entry was posted in Picture of the Day and tagged bike commute, bike minnesota, bike tour, bike touring, bike tourism, biker chick, Biking in Minnesota, fun bike picture, May bike ride, Minnesota River road tour, pic of the day, road bike, Saturday fun. on May 19, 2018 by Russ Lowthian. 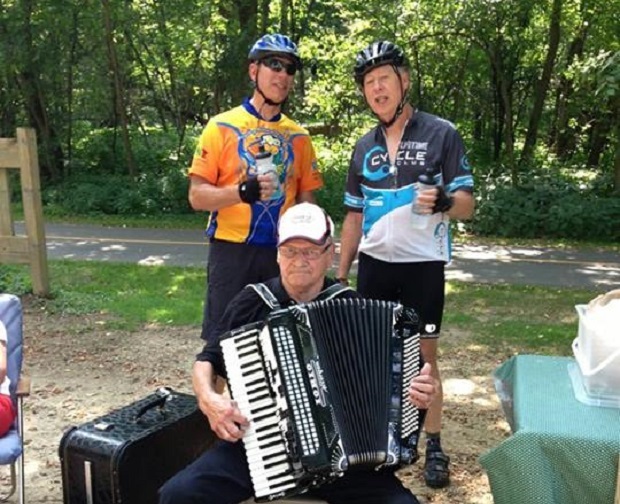 Stopping along the trail these two cyclists cant help themselves, picking up the tune being played by the gentleman with the accordion. Photo taken by Dawn Wilson on the Tour of Lakes ride, in the Brainerd Lakes Area of Minnesota. This entry was posted in News and tagged Biking in Brainerd, Biking in Minnesota, Minnesota trails, MN trails, Paul Bunyan Trail on November 5, 2015 by Russ Lowthian. Bike Pic Oct 14, Nice Ride Fun! Fun on Nice Ride, here a couple of cyclists ride the bike friendly streets of Minneapolis, MN. 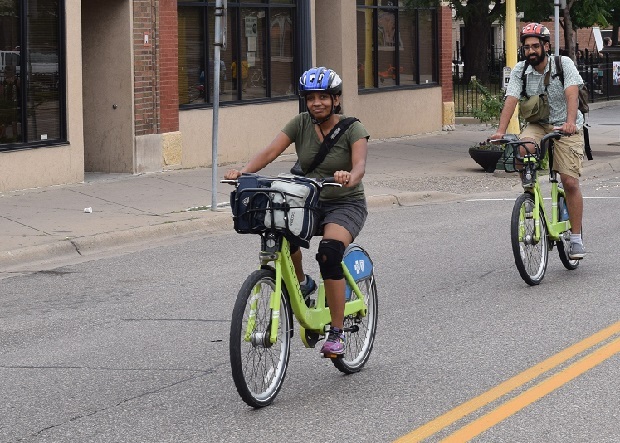 For more information on Bike Friendly Minneapolis, click here. This entry was posted in News and tagged Biking in Minneapolis, Biking in Minnesota, Nice Rid MN on October 14, 2015 by Russ Lowthian. 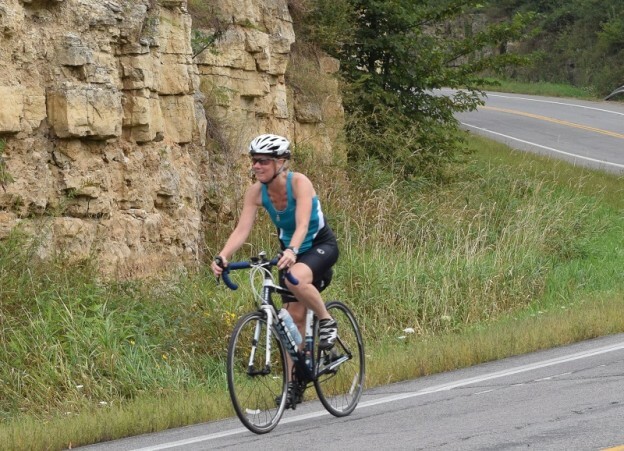 Riding down the Apple Blossom Scenic Byway, this cyclist was all smiles as she cruised into La Crescent. in SE Minnesota. This bike friendly roadway is also a part of the Mississippi River Trail that stretches from the rivers headwaters, at Itasca State Park near Bemidji, to the Gulf of Mexico, below New Orleans, in Louisiana. 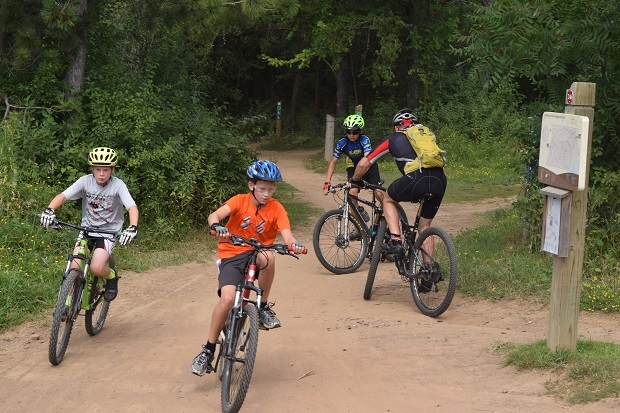 This entry was posted in News and tagged Apple Blossom Fun, Biking in Minnesota, fun bike photo opportunities, Minnesota trail on September 28, 2015 by Russ Lowthian.